1. Dine Like a Local - Vancouver USA&apos;s local eateries showcase the best of the Pacific Northwest from contemporary pubs to intimate, upscale restaurants. Local establishments offer menus focusing on seasonal ingredients with dishes including brick oven roasted salmon with roasted carrots and crispy sweet potatoes to braised short ribs with Yorkshire pudding. Visitors will discover local favorites like the Northwest-inspired Willem&apos;s on Main, the made-from-scratch Italian fare at La Bottega, or the new gastropub, Frontier Public House. 2. Explore the Arts District - Visitors head downtown to the Vancouver Arts District for the First Friday of each month to mingle with regional artists as eclectic art galleries and artisan boutiques open their doors to celebrate the growing art scene. 3. Step Back in Time - Vancouver&apos;s colorful heritage dates back over 200 years ago when Lewis and Clark&apos;s expedition landed them in the Pacific Northwest. The Fort Vancouver National Historic Site offers visitors the opportunity to witness first-hand this centuries-old history. At the iconic site, visitors can also explore Officer&apos;s Row featuring Victorian-era homes including the Grant House and the Pearson Air Museum located next to one of the oldest operating airfields in the U.S.
4. Stretch Your Legs - Miles of trails in Vancouver USA offer hiking enthusiasts the opportunity to explore the wonder of the great outdoors. Lacamas Heritage Trail, Burnt Bridge Creek Trail, and the Waterfront Renaissance Trail boast beautiful scenery including waterfalls, river views, and old growth forests. Just a short drive away is the Columbia River Gorge with challenging hikes like the Dog Mountain Trail featuring rolling meadows and panoramic views of the Gorge. 5. 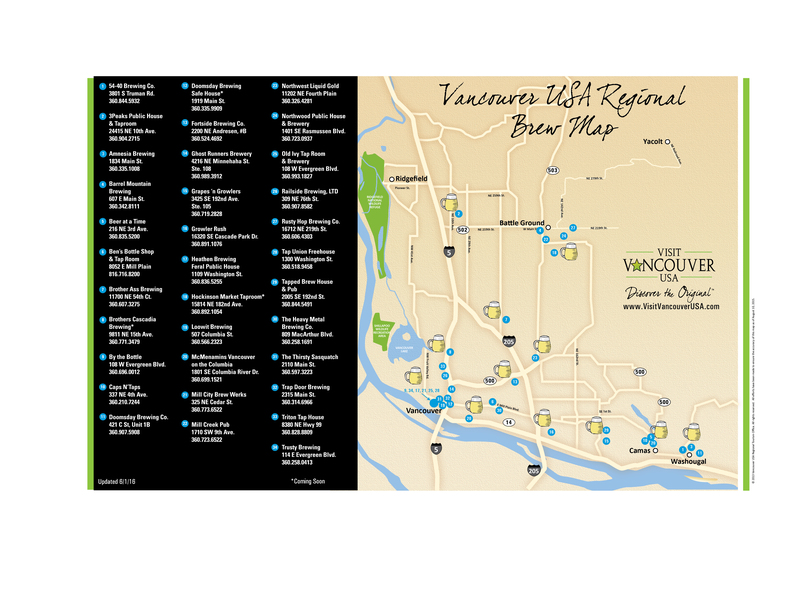 Find Out What&apos;s Brewing - Today, a collection of over 30 craft breweries and taprooms call Vancouver USA home. With microbrews from dark stouts, hoppy IPAs and well-balanced ales, beer enthusiasts will have their taste palettes covered. For a full list of breweries, check out our regional brew map.